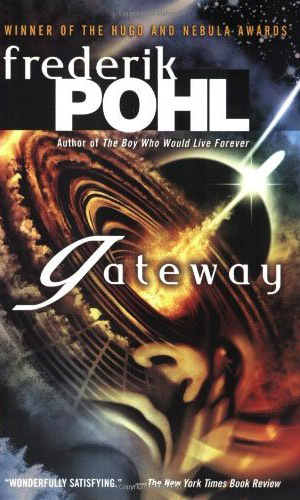 Gateway is the first novel I've read from the mind of Frederik Pohl in fact it's my first exposure to the mans body of work despite reading a lot of "classic" scifi over the years. I can't really remember why I decided to pick up this novel but I think it just happened to be in the Masterworks Collection which was being promoted at the time. Gateway is the first novel in the "Heechee" saga a 4 novel series which tells a story about the human race and an overpopulated Earth who find technology (mainly ships) from a missing intelligent race but the human crews (volunteers under a corporate profit led banner) are only along for the ride and a lot of them never come back or if they do they are dead. The central character of the story is Robinette Broadhead who as a lowly worker won a lottery which gave him the funds to sign up for the Gateway project and the chance to visit the stars, we follow him as he learns how to live on the Gateway asteroid and the friendships and loves he finds there. He also learns a lot about himself and each step takes him closer to risking everything on using one of the "Heechee" ships to travel to an unknown destination in the hopes of returning with a discovery. The story is told in flashback as "Bob" a now very wealthy man talks to a Sigmund a computerised psychiatrist and we learn how he became rich and why he is an emotional wreck despite all the trappings of success. Racked with guilt over his mothers death and dreams of a unknown woman he battles with Sigmund in an effort to avoid accepting that there is something seriously wrong and bit by bit thanks to the flashbacks we learn the truth and the discoveries he made which changed him forever. Gateway is an excellent novel, not long by today's standards but packs a lot into it's pages as it exploits the two parrallel running stories within the novel. I really hated getting near the end because I just knew there was so much more to find out about Bob and the Heechee race who left the ships and thankfully three more novels exist which continue the saga.